Our COLLAGEN REPAIR SERUM is officially VEGAN! Collagen is fundamental to beautiful skin. In some treatments, collagen is injected into the skin. Topical application of Collagen Repair Serum stimulating nutrients is far more friendly. This serum provides the building blocks necessary to keep the skin strong and healthy. All skin types. Pair with Invigorating Vitamin C Serum for best youthful skin results. 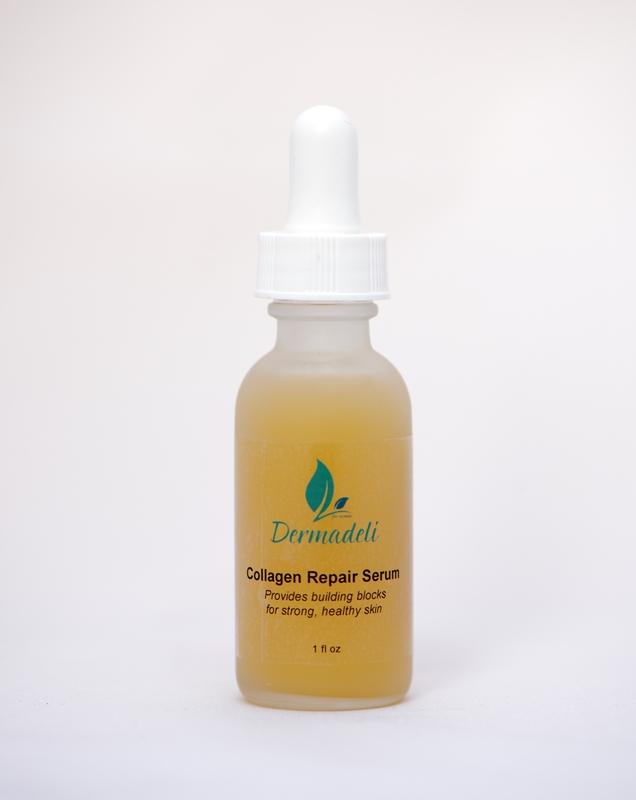 Repair your skin’s collagen with our Collagen Repair Serum. Our skin tends to lose 1% of collagen every year, leaving behind wrinkles and aged skin. Building up your skin’s collagen with our serum will increase elasticity and firmness. Collagen allows the structure of cells to remain firm and intact. This serum promotes maintenance of the native structure of the protein complex and helps protect it from antioxidant damage. Collagen Repair Serum comes in a glass dropper bottle. Directions: After cleansing and toning skin, apply a few drops onto clean, dry skin. Gently rub in using circular motions. May be used daily. Keep refrigerated. I love this product! Finally something that does what it actually says it does. I like that it absorbs, isn’t oily, and I started noticing results within 2 weeks. I’m a client for life! I am very happy with this product! I noticed results right away. I have been using “Collagen Repair Serum” for a few weeks now. The appearance and texture of my skin has really became smooth. Thanks for a great product! ??????? ?I finally found a serum that works. It melts into my skin. I use this in conjunction with her exfoliater, toner, and vitamin C serum. I’m so impressed with the results. My skin has reacted so well with her products. I have healthy firm skin that sings her praises. This serum has done my face wonders… it’s like the fountain of youth trapped in a bottle. I have super sensitive skin and this does so many good things to my face. One thing I love is how my skin tone is more even and how better my face looks with or with out makeup. I recommend this to anyone wanting to make their skin look better. The first Serum I have every tried that actually has made an amazing difference to my skin. Sinks in fast and leaves the skin feeling softer, firmer and healthier. Would recommend to anyone looking for a effective serum.